Dreading this winter season? Dealing with snowy, and windy conditions can be quite a challenge for wheelchair users, and you might be tempted to go into hibernation mode for the next few months. Although it’s safe to stay inside, you don’t have to let the not-so-ideal conditions keep you at home for the entire season. Here is the list of things to do to prepare yourself for the harsh weather outside. Review your Wheelchair’s manual for detailed maintenance instructions and any warnings on how your battery may react in extreme temperatures. Powered wheelchairs are either powered by Seal Acid Lead, GEL, or in the case of our EasyFold’s, Lithium Ion. All batteries lose charge in below zero temperatures and if left outside empty for an extended period of time they can be permanently damaged. If you’re storing your power wheelchair in a non heated area (garage or trunk of your car), you will either need to bring the battery inside to a heated room or leave it plugged in charging. If you leave it plugged in throughout the winter it will shorten the lifespan of the battery due to the increase of charge cycles. This is more prominent with Seal Acid Lead and GEL batteries. Always check the battery charge levels before going out and it’s not a bad idea to keep an extra battery. Get a ramp installed at your home. Yes, ramps are a big investment, but there is no better way to maintain your independence and safety during the winter season and all year round. National Ramp’s aluminum and powder-coated steel ramps (Not sure about this one) are perfect for wet and snowy conditions. When going out on particularly snowy days consider asking a buddy to tag along with you. Un-plowed sidewalks, slushy gutters, and more could threaten your safety and sanity and having someone to help you out if you get stuck is a good idea. At the very least, let someone know where you are going, when you expect to arrive so they can check-in and your cell phone fully before going. A cell phone holder for the wheelchair gives you the option of holding a hot coffee in one hand and your remote control in the other. Give your wheelchair a thorough tune-up. Check your frame for potential weaknesses due to wear-and-tear, tighten all the nuts and bolts, and make sure your tires are in good shape. 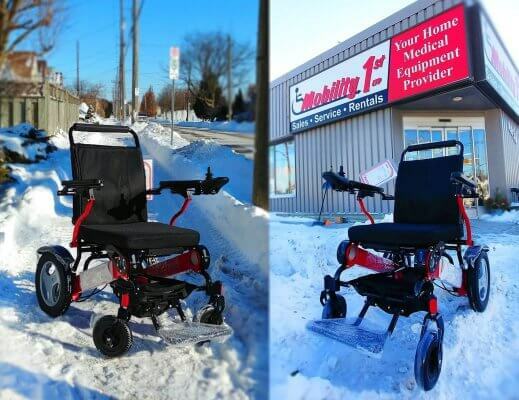 As well to keep your power wheelchair in good shape once you get out of the snow.Once you bring your power wheelchair into a heated environment to allow the snow to dry off and to wipe away snow from all electronic components before it melts. Get a travel bag for your wheelchair. You never know when you might need some extra protection if you get stuck somewhere. If you get stranded waiting for a bus, or get stuck in a gutter, or if your power-chair battery dies or a sudden snow flurry makes your first layer wet, it’s great to have extra supplies. Bring extra socks, gloves, even an extra layer or thermals or a throw-over blanket or wheelchair poncho. Bring extra medication for the day, snacks, and always have water on you. You can become dehydrated more quickly in dry climates and indoor heating systems can also cause you to become dehydrated. Cold sets in more easily when you are dehydrated. Carry an insulated water bottle (insulated so it doesn’t freeze in low temps) with you at all times, and don’t forget about possibly supplementing your electrolytes as well! Pack everything in a bag that’s easily accessible to you. Be careful not to sling too much weight on the back of your wheelchair as that can affect the center of gravity. Picking the right accessories can be a daunting task so it’s important to take the help of experts, and that’s why we’re here! This entry was posted in Easyfold Accessories, Wheelchair accessories and tagged wheelchair accessories, wheelchair travel, winter wheelchair.